We started near Sutton Green on the north side of town and cycled through the traffic lights and on to the pedestrianised part of the High St.
We discussed how as the main way to access the High St from the north it was pretty intimidating for cyclists and certainly off putting for many cyclists having to deal with buses and large vehicles especially as it seems safest to get over to the right to get up the dropped curb (Interestingly, later the same day there was this press release from Sutton Council: Public invited to help shape Sutton town centre’s northern gateway). Then we moved up to where Benhill Ave and Greenford Road cross the High St. Manuel was not very impressed with what we found there, particularly the counterflow cycle lane on the pavement on Greenford Road which is inevitably full of people walking as the pedestrian part of the pavement is full of trees. We looked at where you have to cycle against the traffic on the High St and the conflicts that causes when cycling up the High St or turning in to Benhill Ave to get on to the cycle path. 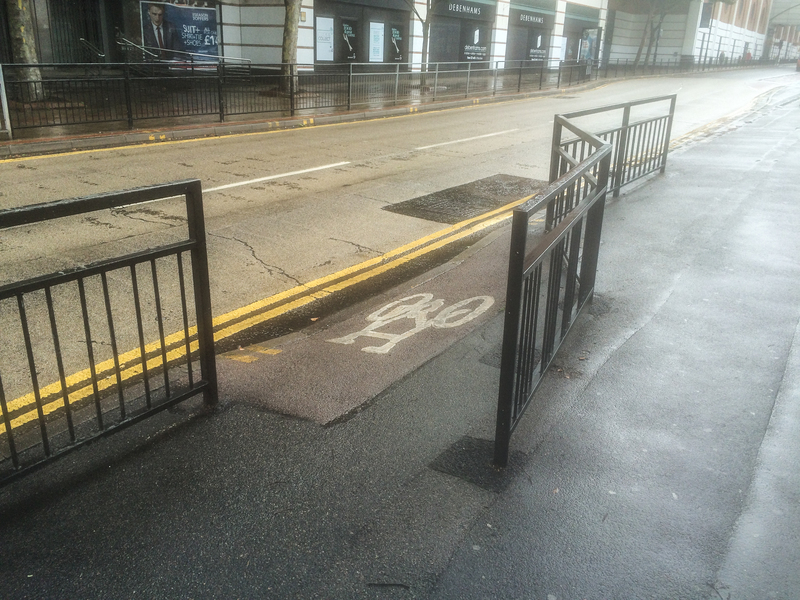 We then crossed over St Nicholas Way and talked about cycling around the one way system. This dropped curb to get you off St Nicholas way and on to Greenford Rd seems very dangerous and hard to use and leads to this path on to Greenford Road. We talked about the possibility of making a few changes to enable the use of the back roads parallel to St Nicholas Way as a north south cycle route. We looked at enabling cycling through the alley down the side of the old gas works/new Sainsburys, down Brandon Rd, removing the barrier from the alley linking to Thorncroft Rd (a pet peeve of Charles Martin’s, Sutton borough co-ordinator LCC) and then allowing cycling against the one way part of the road to link to the alley that comes out on to West St. Manuel seemed to think this was achievable and would be a good way to provide an alternative route to the one way system. We then cycled up Robin Hood Lane and along the Gibson Road cycle path which of course had someone walking in it. Manuel though that this was quite a good cycle lane but needed to be made much more visible and more obvious as a cycle route. Then we cycled down the High St and had a look at accessing it from the East. 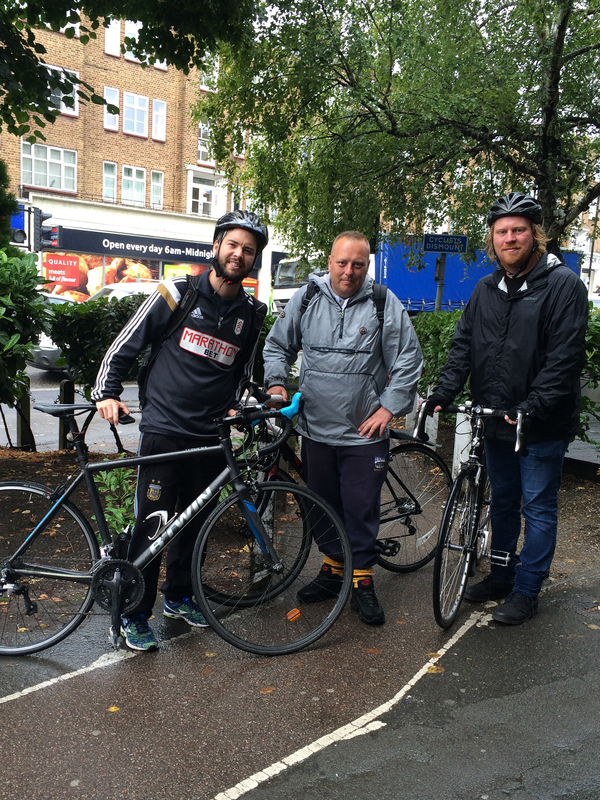 We agreed that the path from Manor Ln and then in to Lodge Place was probably the best of the 4 directions form which you can get to the High St and the way that Manuel himself usually cycles, but that there was still a lot of room for Improvement! We pointed out the ‘No Cycling’ sign and the barrier and watched a few cyclists go through and agreed that it needs to be sorted out to enable cyclists to legally pass through it along their desire lines into Lodge Place. We then headed up Lenham Rd and Throwley Way to look at the cycle path there that is full of trees and bollards and lumps and then past the police station and back to the High St. The access to and from the High St from the South and from Sutton Station is cut off by the Sutton Court Rd/Grove Rd part of the one way system with cyclists having to cross on to the island and then jump in to the road when the lights change, a manoeuvre that Manuel often does as well. The link from the station to the High St needs to be much better as does access to Grove Rd. There was talk of the possibility of a cycle lane along Grove Rd from the High St to join up with the traffic lights and the cyclists only entrance to Grove Rd but the access to and from Morrison’s car park would be an issue. We then talked about cycling from the station south to turn left into Cedar Road which is on Manuel’s regular route and he pointed out a terrible cycle path that I had never noticed opposite Tesco to allow cyclists to cut the corner but we both thought it was dangerous and talked about possibly using some of the space outside the shops on the station side of the road for a segregated route. I also suggested that installing some bike hangers in this area and other places around the borough where there are a lot of flats would be great for enabling more people to cycle that can’t keep a bike in their flat. Manuel said he had seen them in other boroughs and was open to the idea of trialling some. Manuel also gave us some updates from the council. They are currently looking through our Ward Asks, particularly the ones that are on TFL controlled roads with the aim of applying to TFL for funding to carry out the work. He also said that he wanted to keep us much more in the loop and update us more often as to what the Council are looking at and planning and he also wanted to get the Sutton Youth Parliament involved to find out what barriers younger people felt there were to cycling. Overall, it was a very useful trip around Sutton and thank you very much to John for setting it up. Manuel seems keen to take on the challenging parts of Sutton’s roads and enthusiastic that he can push to get better cycling infrastructure and maintains that the political will is there to get Sutton cycling. We also hope to go on a similar ride around Cheam in a few weeks so if you have anything you would like us to look at please let us know. 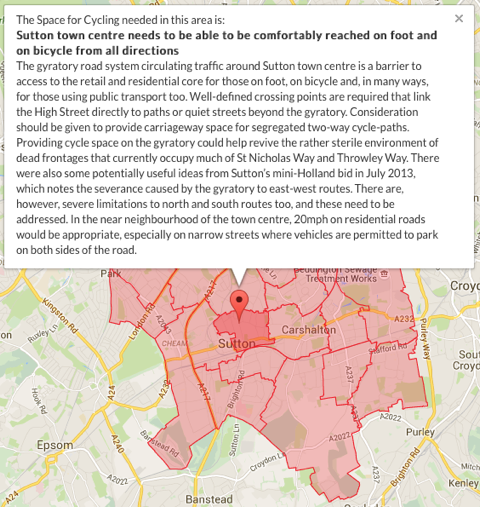 ‹ Sutton’s Draft Cycling Delivery Strategy Consultation – We need your help!